Want to Save Money on Business Travel? Book Early. Editor’s note: The following comes from a Travel Leaders Corporate press release. 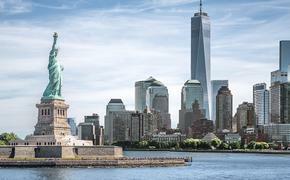 Today, Travel Leaders Corporate released its clients’ first quarter booking data for 2014. The newly-released data indicates that domestic business travelers who book their airline tickets 14-20 days prior to departure save on average 33 percent versus those who book 0-6 days prior, creating the highest percentage of cost savings during this booking period within the last eight quarters. In addition, domestic business travelers who book their airline tickets 7-13 days in advance save on average 25 percent versus those who book 0-6 days prior to departure. Travel Leaders Corporate is a division of Travel Leaders Group – the top travel management company according to Business Travel News with approximately $20 billion in sales. 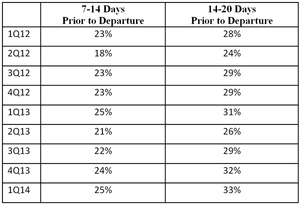 The table below illustrates the percentage of cost savings for a domestic airline ticket when purchased within the designated timeframe as compared to a ticket purchased 0-6 days prior to departure. The recent data also confirms that the average trip length for domestic business travel is typically three days and two nights at a pre-tax and pre-ancillary cost of about $970 per trip. Travel Leaders Corporate’s data also indicates that the average international airline ticket cost has decreased approximately 6 percent with business travelers paying about $93 less per ticket in the first quarter of 2014 as compared to the first quarter of 2013. The average cost per day of a domestic car rental decreased 1 percent in the first quarter of 2014 as compared to the first quarter of 2013, while the average cost per day of an international car rental increased 3 percent during the same time period. The average cost per night in a domestic hotel room was up 2 percent in the first quarter of 2014 as compared to the previous quarter. The average cost of an international hotel room increased 9 percent during the same time period.